Because the project was cancelled in 1976. So, why is it interesting? Well, for several reasons really. Firstly, it's the longest and most nationally important motorway for which there is absolutely no visual evidence in existence . Not one part was built, there are no clues. There are no little sections, no little stubs of road, nothing. The whole thing is almost ghostly. And that's quite something for a 40-odd mile long motorway! to improve the environment of the towns and villages on the existing roads by relieving them of traffic congestion, noise and pollution. In addition, a high standard route would mean greater safety and convenience for all road users. to provide an additional high standard link to the Motorway Network between Stoke and Derby and the M6 and M1 motorways. It would cater for traffic travelling in east-west and south east – north west directions. In the mid-1970s the United Kingdom had major economic problems. Many projects were canned to save costs, and the M64 was one of them. Instead, an upgraded A50, the existing main route in the area, was proposed, following in the same general routing as M64. When this watered down scheme was eventually built, the eastern section followed a completely different route, and the western section linking to the M6 was dropped. This meant that of the three requirements above, only the first was mostly fulfilled (the notable exception being the people in Stoke-on-Trent affected by the cancelling of the western section). The second requirement is partially fulfilled, as to reach between the M1 and M6 involves travelling through congested routes in Stoke-on-Trent and Newcastle under Lyme. The third requirement is not fulfilled at all. As the route as built isn't a motorway, most people are barely aware of its existence, and it has utterly failed to act as any real bypass for the West Midlands and the M6. It's almost certainly fair to say that had the M64 been built, the M6 Toll would probably not have been necessary. So, can you take me through the route? The route is accurate as are the locations of all the junctions, but the layout of the junctions on the route are "best guesses", based upon other motorways built at the time. In addition, the cuttings, bridges and embankments of the modern-day A50 have been left in place to show the difference in route. No equivalent to this section has ever been built, so as such it looks really odd on the map! We start on the M6, to the south of the present J15, where only north to east (and reverse) traffic is catered for. If that seems odd, then remember that it's to avoid the West Midlands. Traffic from the West Midlands and the South West was supposed to use the M42 to reach the M1. Before long, we pass to the south of the village of Tittensor, through a deep cutting, and onto the first junction, with the A34, which would have allowed better access to Stone from the north. We've taken the liberty of diverting the A34 to the other side of the Trent to make a little more room for the junction! From there, we pass through a series of cuttings and embankments to deal with the hilly landscape, and reach the villages of Fulford and Saverley Green, where we meet the next junction: the Stoke Spur. We've put a roundabout junction in here, and the spur heads off to join the already-constructed Blythe Bridge bypass halfway along. Echos of this can be seen today, as the modern A50 joins the bypass at a roundabout halfway along the Blythe Bridge bypass. Would the Stoke Spur be a candidate for Pathetic Motorways had it been built? Possibly! Would it have had its own number? Again, possibly - I have no evidence either way on this point. We follow the line of the modern A50 from here to the edge of Uttoxeter, where the M64 goes slightly to the north, and the only junction on this section pretty much due north of the town centre, where we have a very short spur to the (then and now!) A50. Again, a fairly dull-looking rural section. The only junction is halfway along with the A515 north of Sudbury, and the M64 is still generally to the north of the modern A50 route. Just to the west of Hilton Lodge, the line of the M64 joins the modern A50, for the longest section that was actually built along the original planned route. Included in this section is the junction with the A38, just south of the Toyota factory, but the most interesting item is to the east: the Derby Spur. 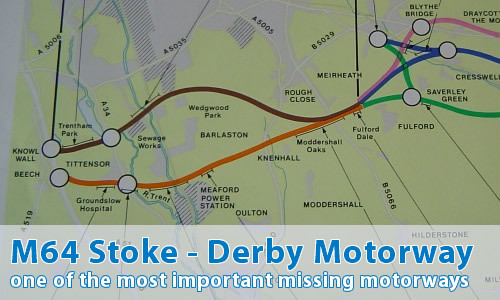 The Derby Spur would have formed a link between the industrial area of Sinfin and the motorway network, as well as access to Derby itself. The junction for the industrial area has been given south-facing sliproads only, as the entire point of the junction was to allow access to and from the main network, and to discourage traffic commuting into Derby from taking the small section of the spur. The spur would have ended on the A514. As with the Stoke Spur, it would probably have been a candidate for inclusion on Pathetic Motorways in its own right! Would it have had its own number? Again, I have no evidence either way, but I would suspect that it was more likely to have had one than the Stoke Spur; the junction in the middle would have seen to that? M641 anybody? At Chellaston, immediately after the Derby Spur junction and the A514, the M64 and modern A50 diverge dramatically, never to meet again! Whilst the modern A50 heads northeastwards, the M64 turns sharply south and then east, heading to the opposite side of Castle Donington. The route heads south of Weston on Trent, crosses the original route of the M42 (which would have had a junction here), and comes very close to Donington Park motor racing circuit and museum. There was to be a junction right outside the main entrance (handy, eh?) with the original line of the A453. This junction would also be used for East Midlands Airport. Then we reach the M42 (or in modern terms, the A42!). The more northern, original M42 route was cancelled in March 1976, prior to the cancellation of the M64 later that year, with the modern route being shown in publications dated December 1976. We have chosen to use the later version of M42 as this was the case immediately before the M64's cancellation. We also just about miss the site of a proposed M1 Service Area at Long Whatton - whose entry and exit points were completed, and can be seen today. Can I comment on this motorway? Of course! Contact me and I'll put them here! Have any other visitors commented? The M64 thing really fascinates me. I have to travel from Manchester - southwards a lot. Once the A50 was upgraded i thought i was in heaven. I consider it the 'free' M6 toll road. Even on Friday evenings it is pretty free flowing, the surface is nice and fast and to naughty boys like me you rarely see traffic police. Obviously I think if it was motorway more people would use it but i still think of it as a bit of a secret. That is why i dont think it is a poor relation - more of a attractive cousin you only see at weddings. What I could never understand (especially when they were building it) was the way it ploughed through Stoke. The southerly by pass in Section 1 and 2 of the M64 would have made much more sense and would have been less destructive and disruptive to the poor people of Stoke. If there ever is problems it is always on the stretch that ploughs through Stoke. Once you get to the Blyth by pass it is plain sailing and there are lots of highlights. The JCB and Toyota buildings, the tiny stone bridge just to the north (cant remember the exact spot) that must have once carried an ancestor of the A50, the little shop just opposite the petrol station/ mcdonalds at Uttoxetor which means you don't have to pay service station prices,the beautiful junction that carries the A38 over the top (i even have a photo of this junction on my wall I love it so much) and the wonderful site of the powerstation as you drop down into the trent valley and you know the M1 is not far away. An M64 would have been nice but I'm very happy with the A50 thanks. Somebody at Microsoft obviously knows about the M64. I was using AutoRoute 2005 to compare the motorway on your diagrams with the modern A50 when it struck me that some of the junctions are numbered. They’re only as far as the A515 heading west (where they go slightly out of sync) but they roughly match what the M64 would have been from your maps – and the very junction numbers that you quote too. For example, the one with the A38 is clearly marked as “4”. After that area, the motorway diverges from the A road and they stop using numbers… is it me, or is that spooky? Maybe there’s hope for the motorway yet? Someone seems to think so! If the M64 was built, it may have made it a little quieter where I live. I am less than 1/2 mile from the A50 Blythe Bridge bypass section and sometimes the traffic noise is rather loud. On the other hand it is rather handy for getting to a mate's house in Stoke - the trek through Meir, Longton and Fenton on the (now) "old" A50 if the M64 was built would have been a pain. One problem with the A50 that the M64 wouldn't have had is the roundabouts - the one at Blythe Bridge quite often has a lorry tip over on it; yesterday a lorry broke down at one of the Uttoxeter roundabouts. By the way, the stone bridge is over the River Dove between Uttoxeter and Doveridge and the power station is Ratcliffe (the disued one by the A50/A38 junction is Willington). I'm intrigued by the Derby Spur - this would go right past the VIP entrance at Rolls-Royce's Moor Lane site! Would make life for the average RR worker more pleasant, though - straight off Victory Road and on to a motorway... I doubt that residents of Allenton would see it the same way. There is talk of building a link road (with industrial estate attached) from RR to the A50 now; but only from your 'junction 2', and of course it won't be a Pathetic candidate. Shame. I lived in Stone in the 70s and 80s and can clearly remember the heated debate in the local press about this road, and can confirm what Andrew Williams says about the opposition by the good people of Barlaston and Tittensor to any suggestion of a motorway or similar major road (it wasn't clear at the time which might finally occur) ploughing past their villages. There are some quite well-off and influential citizens living in the villages between Stoke and Stone! The threats from Wedgwood to leave the area were a major issue and heavily reported. As Andrew Williams surmises, that's why the A50 doesn't come to the south of Stoke but instead caused major devastation through a swathe of the city. Many thanks go to the William Salt Library, Stafford; Staffordshire Archive Services and Derbyshire Archive Services without whose assistance this page would not be possible. Thanks to Tony Frost for the original 1975 map, and to Ian Bailey for his work creating the route maps. All media on this website is © Pathetic Motorways, except where noted that they are copyright of a contributor.